Explore Naples Florida Fishing while visiting the beautiful and breathtaking Paradise Coast. 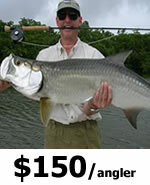 The Gulf of Mexico is a fantastic body of water that holds excellent fishing all year round. Whether you want to travel into the depths of those waters or the backwater of Naples, iOutdoor Fishing Charters has you covered. 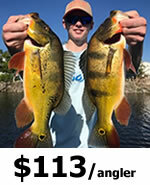 Explore Naples Florida Fishing Saltwater or Freshwater fishing with local expert and professionals. Take a cruise down the beach of Paradise Coast while inshore fishing for Snook, Tarpon, Redfish, Permit, Seatrout and many more. If you are looking for larger game fish, adventure out offshore fishing in the Gulf for species including Grouper, Snapper, Kingfish, Wahoo, Shark and more. Naples, Florida is the Perfect destination to bring your family fishing while visiting on vacation. 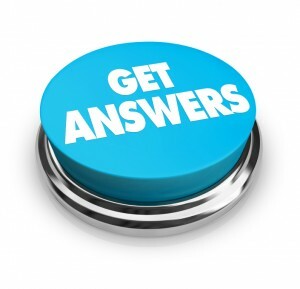 Many ask “Can I freshwater fish in Naples?” and with iOutdoor, you most certainly can. Freshwater fishing for Peacock Bass or largemouth bass is also an option on a Naples Florida Fishing Charter. Never get seasickness while discovering the urban canals of Naples or the incredible nature of the Everglades. Join us for a fishing adventure of a lifetime for the variety of species Naples can offer! 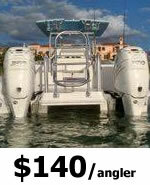 Search iOutdoor, Compare & Book the Best Naples Florida Fishing Charters Today. Colder temperatures are pushing inshore species into deeper water especially in the backwaters and bays. Search out and cast for Sea trout, Redfish, Pompano and large black drum that flourish when its cold. Inshore fishing is dominant this month as the weather is unpredictable. 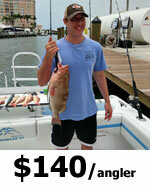 Enjoy catches of snapper, trout, sheepshead along with some snook and redfish. 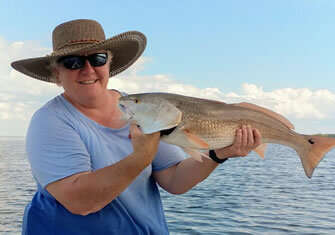 Inshore fishing species are starting to get really active especially in the backcountry. Snook start to move toward the inlets and passes. Tarpon are on the move to the flats and coves and trout are strong on the flats filled with grass. Great month to go inshore fishing. Temperatures are beginning to get warmer in April but weather can still be unpredicatable. 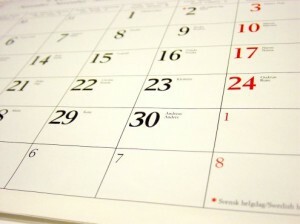 If things are right, this month can provide great fishing for snook, redfish, tarpon and shark. May starts the Snook spawn here in Naples, FL. You can find them along the shoreline and passes. If you are out in the early morning, get hooked up on a tarpon. 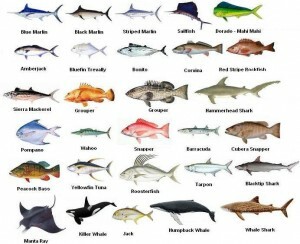 If you love to sight-fish, this is the month to inshore fish in Naples. 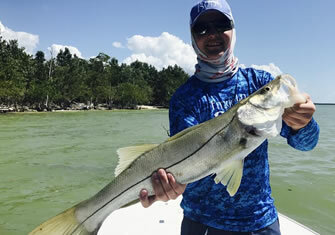 Catch and release Snook per FWC regulations. You can also get a good bite from tarpon and sharks whether you are along the beach or in backwater shallow bays. Temperatures are rising and things are getting warm. Get out on the water in the morning or late afternoon for great catches from Snook and sharks. Offshore fishing reaches a peak this month in Naples. The seas are calm allowing you to adventure out and fill the freezer full of snappers, groupers and kingfish. Weather can yet again be highly predicatable during the peak of hurrican season. 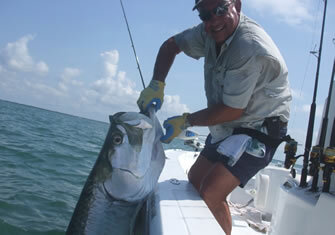 Enjoy catching kingfish and spanish mackerel near shore along with big bull redfish. Cooler weather brings the perfect opportunity to spend all day on the water. Travel the back flats and bays for excellent redfish fishing. The Holiday season always brings great fishing and awesome weather. 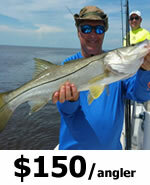 Get out on the water to catch quality Snook, trout, pompano, redfish and jack crevalle. Kingfish, Snapper and Grouper can be caught offshore. Call us at +1 (888) 412-1117 and let’s start planning your Naples Florida Fishing charters!